Father was a textile/dry goods merchant doing business as Joshua L Baily & Company. There is a textile company by that name today in the New York City area. President, Cricket Club. Won following prizes in cricket: First Prize for Bowling, 1883; First Prize for Fielding, 1883; First Prize for Highest Score (56), 1883. In 1942 he registered for the draft and was employed by Joshua L. Baily and Company, 40 Worth Street, N.Y.C. In 1900 he received a government appointment as Inspector of Birds and Mammals at the Port of Philadelphia. In the last two years of his life he compiled a list of 207 species recorded at Haverford College since the time of his graduation. In the 1880 US census William Lloyd Baily, age 18, was listed with his parents and other family members at 1624 Arch Street in Philadelphia. William was listed as being “at school”. In the 1886 Philadelphia City Directory Wiliam Lloyd Baily is listed as living at 1624 Arch Street in Philadelphia. In the 1887 Philadelphia City Directory Wiliam Lloyd Baily is listed as living at 1624 Arch Street in Philadelphia. In the 1888 Philadelphia City Directory Wiliam Lloyd Baily is listed as living at 1624 Arch Street in Philadelphia. In the 1889 Philadelphia City Directory Wiliam Lloyd Baily is listed as living at 1624 Arch Street in Philadelphia. In the 1892 Philadelphia City Directory Wiliam Lloyd Baily is listed as living at 1624 Arch Street in Philadelphia. In the 1894 Philadelphia City Directory Wiliam Lloyd Baily is listed as living at 1624 Arch Street in Philadelphia. 1n the 1900 US census we find Wiliam Lloyd Baily, age 38, living with his father (widowed) on Lancaster Avenue (no specific address), in Lower Merion Township, Montgomery County, PA. With William is his wife, two sons. There is also a waitress, a nurse, a cook, and a gardener living at the address. In the 1910 US census we find Wiliam Lloyd Baily, age 48, living with his father (widowed) on Lancaster Avenue (no specific address), in Lower Merion Township, Montgomery County, PA. With William is his wife, two sons and a daughter. There is also three servants, a nurse and a coachman living at the address. In the 1920 US census the William Lloyd Baily family (William, his wife, their three children, and four servants) were living on East Lancaster Avenue in Lower Merion Township, Montgomery County PA. The house number “220” is crossed out and the added entry is probably “Frm” (farm). Based on entries on the same page the residence was probably near the intersection with South Church Road. In the 1930 US census the William Lloyd Baily family (William, his wife, one child) were living on Lancaster Ave in Lower Merion Township. No street address is listed. Based on entries on the same page the residence was probably near the intersection with Wynnewood Road. In the 1940 US Census the Wm. 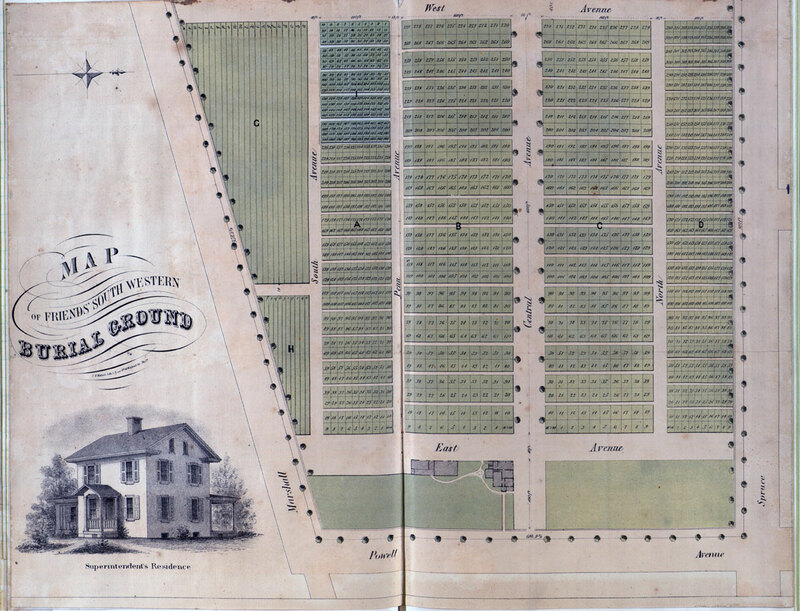 L Baily family (William and his wife) were living on Lancaster Avenue in Haverford, Lower Merion Township, Montgomery County, PA. Unable to determine street address from listing. The top of this map is oriented to ENE and not to North as is common. Click Here for detail of cemetery.